Boz in a self-induced apple coma. Yesterday I picked from two of my favorite apple trees: Bramley’s Seedling and Belle de Boskoop. 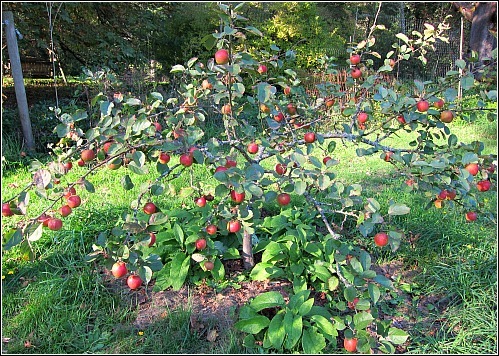 Each orchard youngster yielded about 20 pounds (or one case each) of crisp, tart, fresh-eating, sauce-making, pie-ready apples. As you can see from my string of adjectives, they are exceptional all-purpose apples. My Belle de Boskoop apple tree seems to be a biennial producer, and a natural self-thinner, dropping the runt apples early in the season. 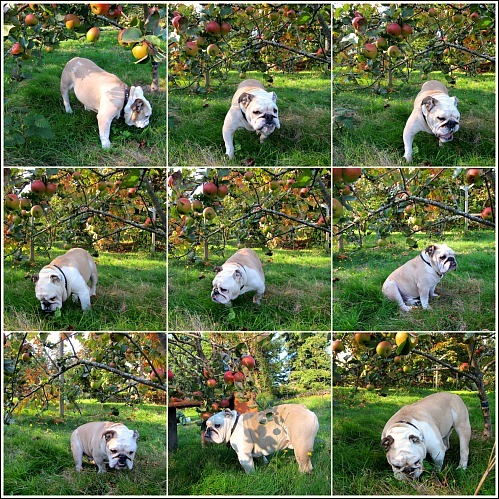 Boz sniffs out the fallen apple, dispatches it quickly, and without a trace of evidence. A few seconds to digest it all, and then on to the next apple. As dog breeds go, I would venture to say an English Bulldog is a veterinarian’s favorite patient. Sure they’re cute, cuddly and comical, but for a seasoned vet, one bulldog represents a week of helicopter skiing in Aspen simply on skin care charges alone. As you know I have two bulldogs, so when I walk through the door with Boz and Gracie, and see him smile, I wonder will our visit be funding a time-share in Kona, or a down payment on a Paris apartment? Lucky for me, Boz and Gracie have been relatively healthy bullies. I attribute it to at least one apple a day, a couple belly rubs, naps as needed, and a whole lot of love. Come to think of it, that’s my regimen for keeping healthy and happy, too. Your Belle is a beautiful tree. I was disappointed when I looked it up to see it does not like COLD or dry soil—of which I have both. Such a pretty thing. Ah well…………. Your dogs look so content. They are indeed living the good life! Hi Sue, I was thinking about your COLD climate and found these links that might help you find the right apple for your own backyard. They are such sweeties! 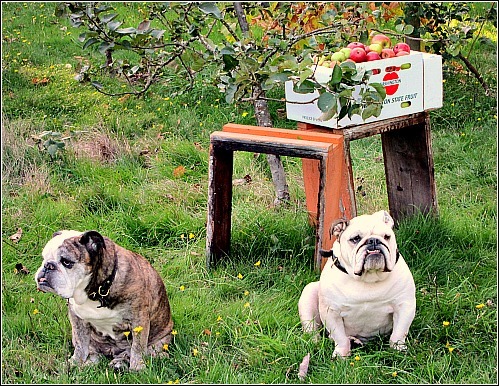 I’m a bit of an apple addict as well…never heard of those two varieties, however. 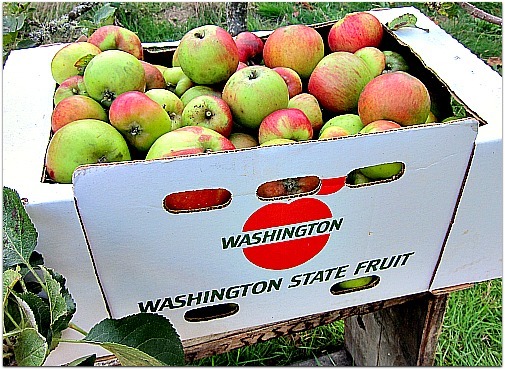 One of our area nurseries had their apple-tasting festival last weekend…and I always scoop up a big sack of my favorites…the Cox Orange Pippin and Cortlands…delicious! Ah Scott, you have good taste in gardens AND apples. While I don’t grow Cox Orange Pippin, I did plant a Cherry Cox Pippin and its flavor is a surprise to your tastebuds. Su-weet and tart all at once. Pipi and I are trending in the same direction. Apples for me too! My goal by the time I am 50, I have 7 more years, is to have an established fruit orchard. I will have to see if these two varieties will grow on Beaty’s Creek. Love your blog and your pups! Hi Stacey, Here’s to your fruit orchard! Check with your local extension for disease resistant varieties. It really helps in the long run. Looking forward to reading about the gas-harnassing apparatus soon, Tom! 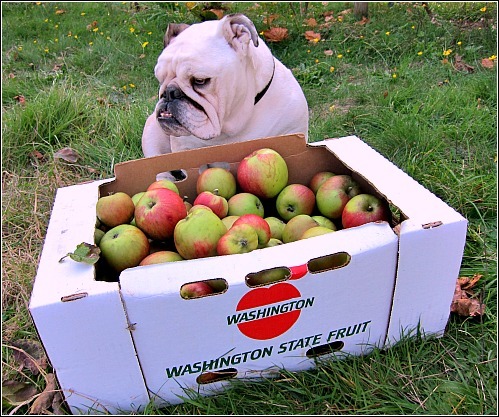 Our chickens, ducks, rabbit and resident deer are enjoying an abundance of King apples this season, but our canine companion isn’t so fond of them. Her favorite? Asian pears! She’ll munch on those all day long. A friend welcomed a 2-year old English bulldog into her life recently and I sent her to your blog. I trust she’ll be entertained at her computer and with her new companion. So glad Denise and I got to visit Tall Clover Farm this summer. Your blog subject matter, photos, humor and reminders of what’s important continue to feed me. Diane, I may just back them up to the hearth and utilize their talents for starting fires in the fireplace. 😉 And as for King apples, I love ’em. They usually are pretty huge, 3-4 apples makes a pie. I bet your friend is in love with her big ball of wrinkles and fur, nothing like a bulldog in the house. Give my best to Denise, and let me know any time the spirit moves you for a return visit. And thank you for the kind words, and I will be sure to thank Mr. Mitch for being the one to introduce us. Years ago I had a dog that the vet discovered was allergic to beef. While I was clearing the cabinets of all the beef bones, she grabbed a carrot from the counter and I was amazed to discover she loved them! Hence, my lovely Pepper girl became a canine vegetarian! I’m also an apple junkie enjoying them fresh the most but wouldn’t turn away a slice of pie. I live in the cold north, too, but a neighbour has the most beautiful apples that just fall and become wasp infested. Next season I will be knocking on her door with my ladder and a basket. I would love some cider. Another great post. Of course, Lauren and I are always particularly fond of those where your dogs play a prominent role. Have you ever thought of writing a book or a memoir – perhaps from the perspective of Boz & Gracie? With your wit and creative take of your island adventures, I can’t help but think it would be a big hit!